What Are the Best Phone Plans for Canadian Snowbirds? If you’re planning on spending your winters outside Canada, keeping in touch with family and friends will be key. Finding the right phone and/or roaming plan is essential. Otherwise you could unexpectedly get stuck with outrageous long distance and roaming fees in the hundreds or even thousands of dollars. But the good news is, there are so many new ways that you can now keep in touch and most of them are very affordable. 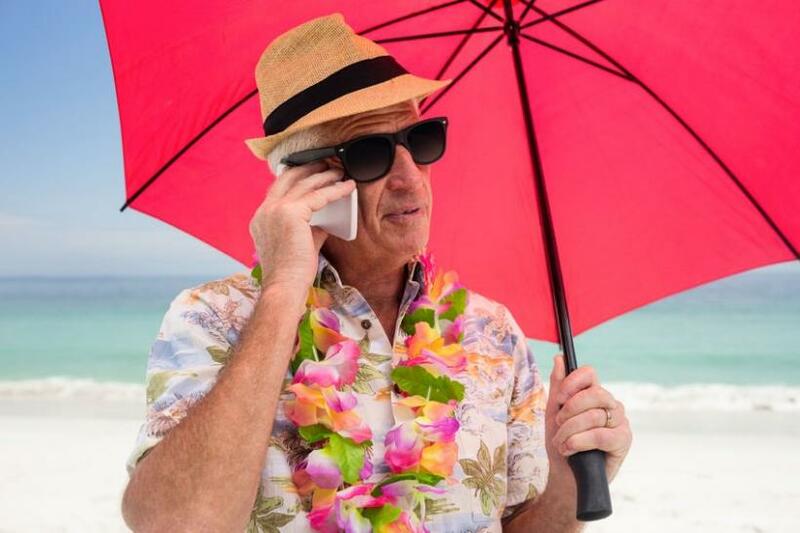 While most snowbirds now opt for mobile solutions, landline options are also available for those who prefer them and/or own a vacation home. Most rental units come with a land line if they are privately owned. Many condos require a land line for gate access, etc. If you own your own home, you have the option of including a landline with an unlimited long distance plan if one is available in your area. Often these are the cheapest solutions. You’ll want to seek out a phone service that’s convenient, easy to use, reliable, cost effective and lets you communicate locally, as well as with your friends and family back home. The option that’s best for you will depend on your needs, budget and comfort level with technology. Where you spend your winter will also impact your decision – Hint: The U.S. usually has the best long distance solutions for Canadians. International plans and roaming are generally much more expensive. To help get you started, our snowbird experts have created the following guide to phone and other options for snowbirds to keep in touch. Keep in mind that the landscape is always changing for snowbird long distance solutions, so keep an eye out for new plans, services and apps! Most major carriers now have affordable roaming plans for the U.S. that allow you to make and receive calls locally in the U.S. and back to Canada. Check to see the latest offerings of your mobile phone provider. Obviously, there’s a greater convenience in keeping the same phone with a number that all your friends and relatives already know. It also eliminates the hassles associated with having multiple phones, swapping SIM cards or using an app or calling card to make calls. However, you won’t want to do this unless you have an affordable plan, so be sure to check out what your carrier offers and remember to make sure it includes long distance, local calling in the U.S., text and data. The only minor drawback to this option is that friends in your winter destination will have to call your Canadian number, which may cause them to incur long distance charges if they don’t have a long-distance plan. To cut down on your data usage while you are away, be sure to use Wi-Fi on your phone whenever possible. Some people prefer to have a separate mobile phone while they are in the U.S. There are many options to do this but you need to look carefully at the plan you are signing up for. You might be better off with prepaid plan rather than a contract because you will not be using the phone for at least 6 months of the year. If you do sign up for a plan for a period of time, ask about whether you can suspend the service when you are back in Canada. Make sure you find out what the cost of long distance to Canada is and weigh that against the costs of using your Canadian phone. You’ll also want to understand the cost of data and text. The obvious drawback is that you’ll have a different phone number that everyone will have to remember, including you! Outside the U.S. – Getting a local phone is also an option if you spend your winters in a country other than the U.S., but make sure you understand the terms, costs and long distance rates for your plan first. Travel SIM Cards combine many of the benefits you get from a local U.S. SIM - like affordable rates and a local phone number - with the features and convenience you’re used to with your cellular service at home. To use a Travel SIM Card, simply swap your regular Canadian SIM Card for your Travel SIM Card when you cross the border. Depending on the plan you choose, this quick and easy process can offer significant savings versus your Canadian carrier’s roaming rates. It also saves you from having to visit a dealer and set up a local U.S. service during your time outside Canada. Many Travel SIM Cards can be conveniently purchased before you leave home and used again for future trips. They work in any unlocked device, including your regular Canadian handset, which your carrier will now unlock for you free of charge. If you don’t want to juggle two phones while away, there are services geared towards Canadians in both Canada and the U.S. offering SIM cards you can pop in your Canadian phone that allow you to make and receive calls in the U.S., as well as to and from Canada and provide you with a data plan for a low daily or monthly fee. To use these SIM cards, you will need to have your Canadian carrier “unlock” your cell phone first, which should be a relatively easy process. If you go for this option, consider forwarding your Canadian number to your U.S. SIM card number so you don’t miss calls to your Canadian cell. Also, if your carrier allows it, you may want to downgrade your Canadian cell phone plan for the winter to save costs, as you won’t be using it much while you’re away. Keep in mind that if you plan on returning to Canada during the winter, you’ll need to temporarily swap your Canadian SIM card back in your phone while you’re home. Outside the U.S. – If you spend your winters in a country other than the U.S., there are some companies that offer similar SIM card services, but make sure you understand the plan terms and costs first. As we stated earlier, many rental units come with a land line. Make sure you find out if yours includes free long distance. If the rental unit owner has such a plan can you use it? If you own your own property, you can likely find a very inexpensive North American long distance plan for a land line. Many snowbirds prefer talking on a land line and it can be very affordable in the U.S. where plans are much cheaper than in Canada. You can purchase very inexpensive long distance calling cards from just about anywhere including gas stations and convenience stores. These cards offer very cheap long distance rates on a pay-per-use per minute basis. Many of these cards offer an automatic top up when you get down to $2 or $3 and some can even be used in conjunction with a cell phone. These cards are also useful when you are on the road as they can be used in hotels. There are also convenient apps that have similar functionality and pricing models to calling cards. They allow you to make cheap long distance calls from your mobile phone by dialing a number first. There are a number of internet phone solutions which allows you to use your computer or internet connection to make phone calls and long distance calls. This technology is evolving and is not for everyone but if you are curious about it, you can do some research online and look into various Voice Over Internet Protocol –or VOIP phone --solutions that are available. The rates are usually much cheaper than any other type of long distance but the quality of the service, although vastly improved, can still be spotty. You will need an internet connection and sometimes a headset for best quality sound. There are lots of apps that enable you to keep in touch and also to SEE friends and family while you are talking to them. Depending on what type of mobile phone you have, you can access your friends and family using Facetime, WhatsApp, Skype and other apps. You can also access some of these apps on your tablet or laptop. The downside with some of these apps is that you’ll need to use a data plan or have access to WiFi to use them, and the the person you want to communicate with may also need to have the same app. Another good and often FREE way to keep in touch when you just want to send a quick message or don’t need to actually speak is by using text messages or social media sites such as Facebook and Facebook Messenger. Text is not free, so make sure you understand any limits on texting with your mobile phone plan. You can send and share photos on Facebook, Snapchat, Instagram and other sites too. All of these new technologies have enabled snowbirds to keep in regular communication with kids, grandchildren, siblings and friends.